(FORT BEND) – Graduating, and doing so with honors, was the last thing Zach Guthrie ever expected to happen. But on December 14 the 25-year-old put on his black cap and gown and excitedly received his certificate in Heating, Ventilation and Air Conditioning (HVAC) Technology during Texas State Technical College’s Commencement Ceremony at the Rosenberg Civic Center. Guthrie has now joined an alumni network that is more than 100,000 strong. Before TSTC, the Houston native enrolled at Wharton County Junior College and soon realized that a traditional classroom with the study of theory was not for him. The Houston native first heard about TSTC when his mother, TSTC Enrollment Specialist Melanie Pruett, began working at the college. It was after learning about the programs and doing some research that Guthrie decided to enroll in HVAC Technology. Throughout his educational journey Guthrie worked late nights with United Parcel Service (UPS) and attended class during the day, which made it challenging for him to complete the program. 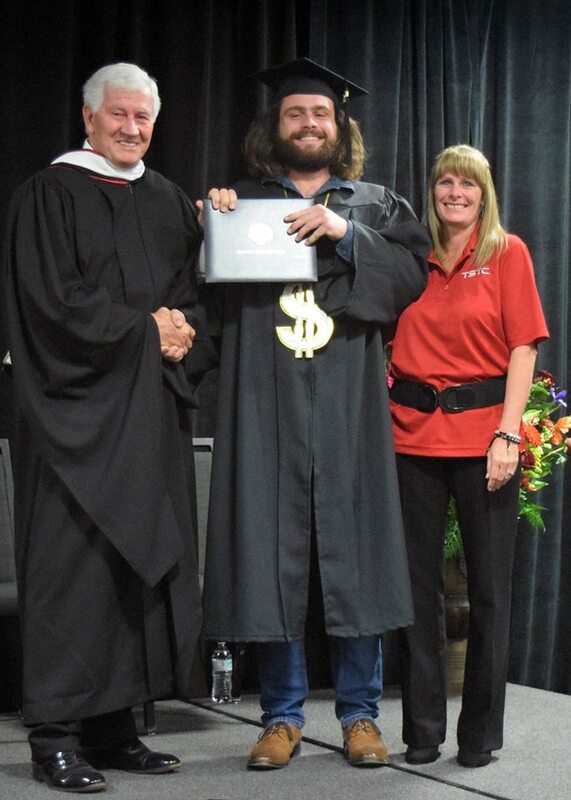 Commencement speaker Michael Dobert, owner/principal of human resource consulting firm HR in Alignment LLC and TSTC Welding Continuing Education student had a special message for graduates like Guthrie. He also reminded students that success out in the field is not only about technical skills, but also soft skills such as leadership, professionalism, work ethic and entrepreneurship. Other speakers who shared remarks during the ceremony included TSTC Provost Randy Wooten, TSTC Field Development Officer John Kennedy and TSTC Regent Joe Gurecky. For Guthrie and his fellow graduates, the end of this chapter means a new one begins and he hopes to find employment with local HVAC companies like Custom Comfort Air or Trane Heating and AC. For more information on TSTC programs, to apply or register, visit tstc.edu. The deadline for Spring 2018 registration is January 2. This entry was posted in Fort Bend County on December 18, 2017 by Amanda Sotelo Sotelo.